As I’m writing this, my feet are recovering and I’m contemplating how long it will take me to restitch my Hmong skirts. This past week I spent time catching up with friends and family and I challenged myself to go to Hmong New Year every day. Also depending on travel plans, I might not be able to go to Fresno Hmong New Year 2018-2019. Additionally, most of the outfits that I wore were made by mom or by me. There is one outfit that I bought and I saved it for the last day. My cousins on my dad side wore matching outfits the first two days of Hmong New Year. The first day we wore outfits made by our respective mothers and paired them with white pleated skirts and phuam paj. I love the simplicity and the vibrant colors of the outfit. My sister and I actually made our own phuam paj because my sister has a large head and can never find hats that fit. In a previous post about it, I showed a couple of pictures of the process. I might make a video tutorial later this year because I want to make a blue one as well. I’ve seen them sell for as low as $10 however, I’d rather make my own because I think the quality of the materials is better and I get to customize it to my head and to my preferences. The second day we wore outfits we made ourselves. For most of us, this was our first time making our own Hmong outfit independently. This day was a bit of a mess because I was rear-ended on my way to Hmong New Year. One of my best friends stopped by to visit and this was her first time going to Hmong New Year. I wore one of my older skirts and it’s much longer than what I’m used to. I love the print on it though. My mom made this outfit and countless others for me. I love the cross stitch embroidery. Nowadays most of the paj ntaub are done by machine and it makes me a little sad that it might become a lost art. Even though I never really matched this hat, I wanted to make sure that I wear it to Hmong New Year at least one day. This outfit is what my clan wears and from the Luang Prabang region. One of my goals this year is to write a Hmong Clothes Series and show outfits of different regions. 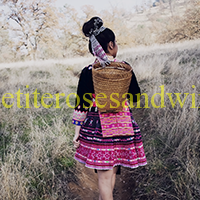 This was one of my last minute projects for a shoot and for Hmong New Year. I actually didn’t finish the hat to mimic the head wrap on time so I opted to just accessorize my bun. My outfit is inspired by Hmong Vietnamese in Ha Giang province. This outfit was a modern Hmong Outfit that I made fitted and I paired it with a black skirt to keep it simple. The textures were a little too similar though. So I have a bittersweet relationship with this hat. I bought it at Hmong New Year and loved the general idea of it. However, I wasn’t satisfied with the front of the hat. Despite paying $50 for it, I took it apart and put it back after adding a piece to match my outfit and fixing the front of it. At least I know how to make it now. The last day I wore my Hmong Thai outfit I ordered overseas. This skirt is the skirt that I’m not looking forward to repleat. Let me know in the comments which outfit is your favorite! Overall, 2017 was coupled with loss and even more growth. As we begin the new year, I hope that my family can continue to heal and become more at peace. Additionally, part of my New Years Resolutions is to update my blog more frequently so fill free to hold me accountable! I can’t wait to share more of my projects with you all. Thank you for reading!